Who is the new girl you ask? Blake Lively. No one, including me, can get enough of this Gossip Girl. The natural beauty has garnered our attention being the star of the hit show, as well as being part of the Sisterhood of the Traveling Pants (ok, so you do not all like that show, but I liked it!). Blake Lively made the Celine Watch Me Work a huge hit, with its perfect 80’s style which is of-the-moment. Now my attention has turned to the sister of the Watch Me Work, the Celine Watch Me Gauffre Bag. 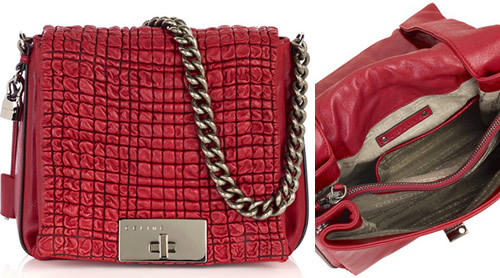 This bag shows off its beauty with piercing lipstick leather with silver link chain straps. The front flap of the bag is where the Gauffre leather appears, popping out and adding oomph. There is a clasp at the front to fasten, press studs to expand the inside, and a zip compartment on the inside. My preference is with the version Blake Lively was carrying, but the red hue and textured material of this version would look stunning. Buy through Net A Porter for $1450.